itch.io Recommends: Ludum Dare 43 Games! It’s the most wonderful time of the year: Chr- Ludum Dare! If you somehow missed one of the biggest jams of the year… welcome back! Last weekend thousands of developers descended upon their keyboards to create new projects under the theme of “sacrifices must be made.” Of course this means that there are now hundreds of new games on the site (as of writing 1345 games are tagged with Ludum Dare 43). So how do you sort through this massive pile of content? You can spend hours delving into each and every entry, or you can take some of our recommendations on places to start. We have an official collection of Ludum Dare entries that itch.io staff members like that we’re continuing to update as we play more games. If that list of games is still too overwhelming, here are an even more reduced list of games to get you started. Farewell, Dear Cargo is one of those games that has a very clear vision of what it wants to do and does exactly that. You play as an adventurer flying home from a busy trip of looting and pillaging when their plane runs into some trouble. What follows is a game of chucking crates out the rear of your sinking plane while trying desperately to remember if the box you’re about to send cratering toward earth can be hawked for pocket change or something valuable that you should keep until you get home. To complicate things, in addition to your plane’s imminent relationship with the ground you also have to keep weight equal between both sides of your dubiously sturdy vehicle. Farewell, Dear Cargo takes this simple premise and builds manic fun out of it. There’s a joy in making a series of split-second decisions that Farewell, Dear Cargo capitalizes on. If you’re interested in maxing out your attention span and doubling down on the decision-making process then Farewell, Dear Cargo is for you. Is Twister the most risque board game? Probably, but who has time for all of that 1960s romantic tension these days? 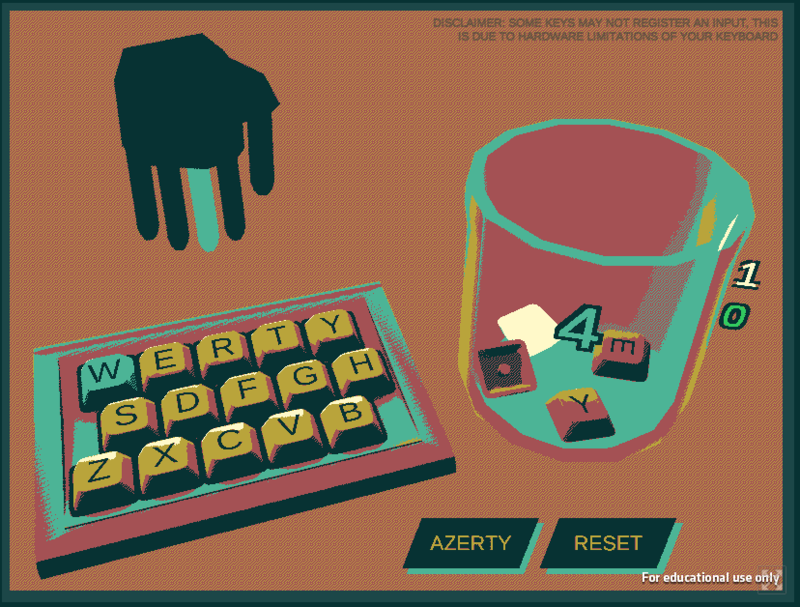 Keyboard Twister takes this sultry event to the digital single-player arena. Instead of moving your inflexible limbs around a thin sheet of plastic, you’ll be working your inflexible fingers around the left half of the keyboard. What results is a high score battle against the limits of your own digits. Honestly, there’s not a ton to say about Keyboard Twister about what you can glean from its title, but it’s a great way to burn some time and stretch your fingers. I’m not 100% sure how the game relates to the jam’s theme, but I’m too busy trying to spin my pinky around my thumb to care. Fixin’ to Die is a game that I noticed based on its incredible tagline: In this war you’re either dead or Fixin’ to Die. Only after digging in more did I realize it was developed by the Seadads AKA an Australian dev supergroup that has also produced some of my favorite jam games ever. Somehow with these expectations in mind I was surprised to see just how good FTD is. On its face FTD is a game about life as a field medic working to save the injured around them. Where FTD strays from this fairly straight-laced principle is the fact that you’re working alone and you’ll never have enough time to save all, or even most, of the people who come through your tent’s doors. As you deal with each patient’s injuries you’re asked to juggle more and more treatments vying for your time and attention in what makes the game’s comparison to Overcooked particularly apt. Fixin’ to Die is a breakneck sprint through the medical arts and one that I can see myself coming back to frequently in the future. What’s this? A fourth game? But we always feature three games! Well, this game was developed by an itch.io staff member (not me) so I’d feel a bit weird giving up a spot to highlight it. Anyway, Bamb is great and you should absolutely play it. Bamb takes the CCG concept of efficient trading and takes it to the extreme. As you start a round of Bamb (Bamb is two player vs AI only) you’re given a stack of tiles numbered 1-7 and some extra modifiers to play on a 4x3 grid. As you and the AI take turns playing tiles your goal is to keep as many high value tiles on the board as possible while any row worth 8 points is immediately cleared. 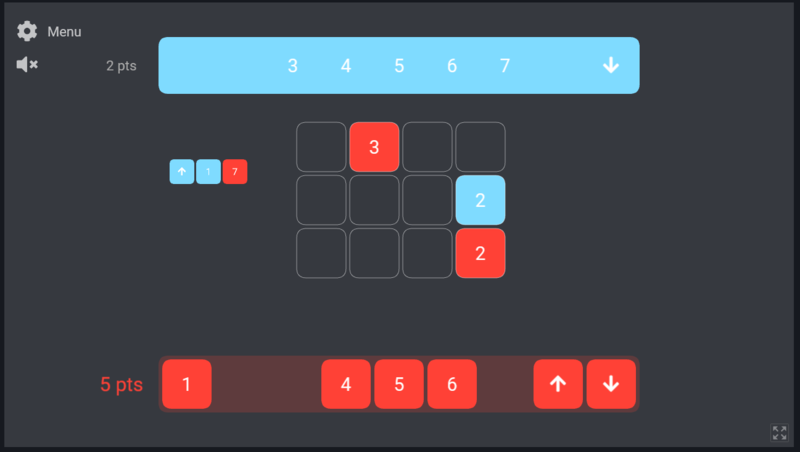 Bamb’s game page describes it as reverse Sudoku and it’s a fairly apt description. There’s just enough depth to Bamb to keep me coming back, but not enough to make it inaccessible and it ends up teaching a concept that you can take with you to any creature combat game. 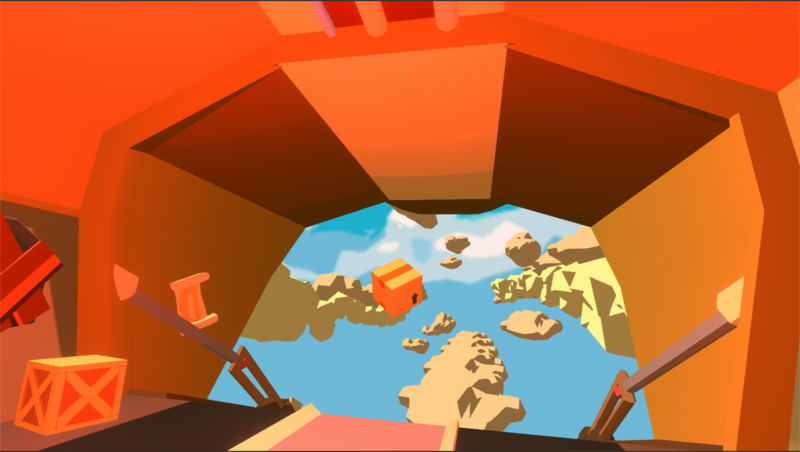 Also you can play it for free in your browser, so you can take it with you wherever you go.